President Donald Trump is once again attacking Attorney General Jeff Sessions, this time for asking the Justice Department's inspector general to look into allegations that the FISA court was misused to surveil Trump campaign adviser Carter Page, an issue raised by a House Intelligence Majority memo released earlier this month. "Why is A.G. Jeff Sessions asking the Inspector General to investigate potentially massive FISA abuse. Will take forever, has no prosecutorial power and already late with reports on Comey etc.," the president tweeted on Wednesday. He then questioned whether the inspector general was holdover from the Obama era (he is -- Michael E. Horowitz was sworn in as inspector general for the Justice Department in 2012) and later probed why Sessions would not "use Justice Department lawyers" instead. "DISGRACEFUL!" the president added. Sessions said Tuesday that the IG would be looking into the handling of FISA warrants during a news conference. The DOJ inspector general has an ongoing investigation into how the Clinton email investigation and other matters related to the 2016 campaign were handled by the FBI and Justice Department. The president's reaction differed from White House Press Secretary Sarah Huckabee Sanders' initial response. She was asked Tuesday about the president's reaction to Sessions' announcement of the investigation into FISA abuses. Sanders noted that it was an issue Mr. Trump "clearly had frustration over, so I would imagine he certainly supports the decision to look into what we feel to be some wrongdoing." She added, "I think that's the role of the Department of Justice, and we're glad that they're fulfilling that job." The president's tweet is his latest salvo against Sessions and his leadership of an embattled Justice Department. Last year, the president raged against Sessions' decision to recuse himself from all matters related to the ongoing Russia investigation, telling the New York Times he regretted appointing Sessions in light of his recusal and referred at the time to the attorney general in a tweet as "beleaguered." Sessions has repeatedly refuted reports that his departure from the Justice Department might be imminent, given the president's critiques, most recently telling lawmakers on Capitol Hill he has conducted himself "honorably and in a manner consistent with the high standards and responsibilities of the Office of Attorney General." "I spent 15 years in that department, I love that department, I honor that department and will do my best to be your attorney general," Sessions emotionally exclaimed to the House Judiciary Committee in November. 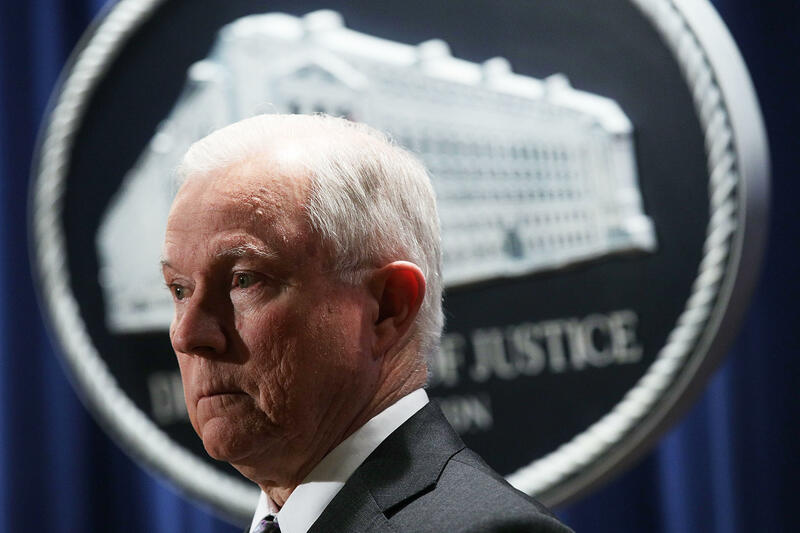 Sessions responded to the president's newest criticism later on Wednesday afternoon, pushing back in a statement, "We have initiated the appropriate process that will ensure complaints against this Department will be fully and fairly acted upon if necessary." He added, "As long as I am the Attorney General, I will continue to discharge my duties with integrity and honor, and this Department will continue to do its work in a fair and impartial manner according to the law and Constitution. CBS News' Andy Triay and Paula Reid contributed to this report.